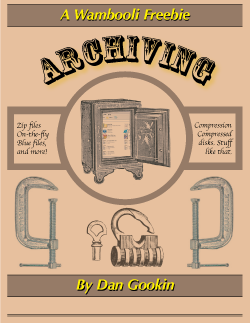 There's a lot going on with ZIP files, aka Compressed Folders. Most people don't know the half of it. Rather than waste precious pages and valuable trees in the real world, I'm giving you — free — my 42-page tutorial on file compression in Windows Vista and Windows XP. Enjoy! Click on one of the above links to view the file, then save it as directed in the archiving document.